So you are thinking about building a room addition. 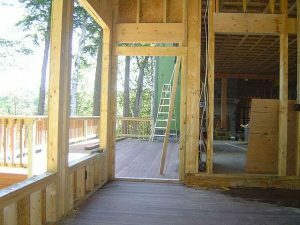 It is important to understand upfront that building a room addition is a major undertaking. It is similar to building a home, and in some respects more complicated. When building a house, it is a standalone entity. With a room addition, you are building it onto an existing home. Thus the addition needs to tie in both functionally and aesthetically with the existing home. Doing so requires significant planning, demolition work, construction of the room addition, and then re-patching back into the main part of the house, siding and roofing. A room addition also has to tie into the home’s existing electric, plumbing and heating/cooling systems. In some cases, larger systems for each one of these respective items may be required if the existing infrastructure cannot support the new living space that comes with the construction of the room addition. Costing out a room addition is another major issue when planning out such a project. Extreme attention to detail is essential when creating the building plans. Fortunately the various off-the-shelf home design software packages can help immensely in this task, as they can automatically generate a bill of materials for the project after it has been designed. Particular attention has to be given to the building material types to be used in the construction as they can dramatically affect the room addition costs. For example, cedar house siding is much more expensive than vinyl siding. Similarly, Anderson vinyl clad wood windows are much more expensive than no-name brand wood windows. So it is extremely important to get accurate pricing on all of the various materials that will be used in the project. Labor costs is another major factor in room addition costs. The best way to get a handle on the labor costs is to get some quotes from general contractors and/or subcontractors for the various aspects of the project. You can then compare their bids to your own material costs estimates to get a handle on what labor is going to cost you on the project. A complete set of room addition plans is essential for not only defining what you want, but for also getting contractor bids, as just mentioned, but also for obtaining building permits, and getting financing if you expect to need it. Building inspectors and banks will look over your building plans to make sure that the project will meet all building codes, and is thoroughly defined from cost and planning aspects. If the plans are not thorough enough you won’t get your building permits and financing. Building a family room addition is also a major inconvenience to the family during its construction. Interruptions to your normal family life will occur daily during the two to three months of construction. There will be the constant loud sound of saws, hammers, compressors and drills, as well as the dirt and dust that come along with them. Be prepared for having contractors walking all over your property, and at times inside your home. I would highly suggest renting a portable toilet while the construction of your room addition is occurring. This way you’ll avoid having contractors coming into your house to use the bathroom. Even with the best upfront planning expect to have to make many decisions during the construction of your room addition. There are always issues that come up, or items that need to be clarified on the drawings. If you decide to act as your own general contractor, which I recommend you don’t, you will have a couple of orders of magnitude of more issues to have to deal with during the construction of the room addition. So be prepared, whether acting as your own general contractor or not, to have to support the project on a daily basis. Lastly, it is vital to hire the right general contractor and/or sub-contractors. Make sure to get multiple contractor bids and compare them closely. Also make sure to check references and contact your state and Better Business Bureau to see if there are any issues with any of your prospective contractors. Also make sure that they are insured. In the end, hire a general contractor or sub-contractors that you feel comfortable dealing with and that provided you with detailed and fair bid(s), and that had start and completion dates that met your building plan schedule. 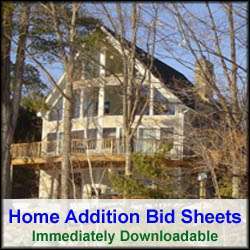 For help on hiring a general contractor see my my “Room Addition Bid Sheet”. 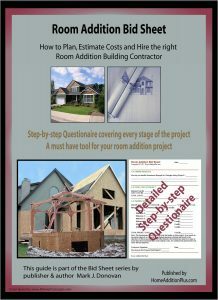 This bid sheet includes a detailed questionnaire for screening general contractors and ensuring you find the right contractor for your room addition project. Also when you select your general contractor, make sure you are clear up front with who will pull the building permits and call the building inspector in for the various inspections required during the construction of your room addition. To conclude, if you follow this simple set of guidelines, you will immensely improve your chances of having your room addition project go relatively smoothly, and come in on budget and schedule.